Jim joined the Queensland Water Resources Commission in 1972 as a Cadet Water Adviser in Rockhampton. He obtained a wide range of experience in irrigation system design and farm dam investigation, design and supervision while obtaining his Certificate in Farm Water Supplies. After completing the certificate he worked as a District Water Adviser in Biloela and then Brisbane. He left the Commission in 1977 to obtain his Bachelor's degree in Civil Engineering from the Central Queensland University at Rockhampton. Jim joined consulting engineers Sinclair Knight and Partners (SKP) in 1980 at their Brisbane office and subsequently was assigned to their Narrabri and Ayr offices. In Brisbane he worked on a 2000 hectare sprinkler irrigation design for the Algerian Government and gained considerable experience in rural and urban drainage and subdivision. In Narrabri, he was involved in all aspects of large scale private irrigation works. While in Ayr he was involved in upgrading existing small and medium irrigation developments for private clients growing sugar cane and rice. 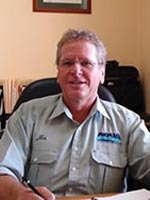 In 1983 Jim formed Barrett Purcell and Associates Pty Ltd. with Dr Hugh Barrett and continued to specialise in all forms of water resources and irrigation engineering. His assignments included a month in Ethiopia on a feasibility study of irrigation development for a State Farm, a month in Papua New Guinea on the design of five commercial irrigated rice projects and a month in Mongolia for the selection and design of four pilot projects for sprinkler irrigation of vegetables. In 1987 he undertook a six week study scholarship of southern India. He is a life member of Irrigation Australia having served on the National Board for eight years with two years as Deputy Chairman and two years as Chairman. He also served on the North West NSW Regional Committee of Irrigation Australia for twenty years and was Chairman for six. In August, 1999 Jim formed Aquatech Consulting Pty Ltd with a staff of six and has continued consulting in water resources and irrigation engineering. He introduced and commercialised the IrrimateTM water use efficiency services in 2000 and jointly developed and introduced the WaterTrackTM whole farm water balance products in 2003.